Stay four nights and save $150. Stay five nights and save $200. Stay six nights and save $250. Stay seven nights or more and save $300. Restrictions and exclusions may apply. Four-night minimum stay required. Explorer's Club for kids features a planetarium and a Chichen Itza rock climbing wall. Set along a scenic spot at the tip of Punta Cancun with a unique, curved, white sand beach. Perfectly situated within close proximity to nightlife, shopping, and restaurants. Specialty mixology classes and wine/tequila tastings available. Four pristine swimming pools: two family pools, an adults-only pool, and a wading pool for children. Three heated swimming pools: a family pool, an adults-only pool, and an infinity pool. All room categories come with jacuzzi on the balcony or terrace. Coral reef one and a half miles off the beach. 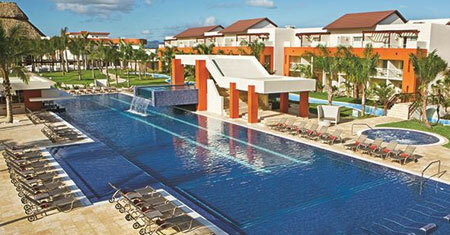 Resort exchange privileges with Now Onyx Punta Cana. Beach features non-motorized water sports just offshore and luxurious Bali beds. Located in close proximity to Punta Espada golf course, designed by golf legend Jack Nicklaus. No matter the room category, all ground floor rooms are swim-up suites. Pirate's Paradise Waterpark, featuring a pirate ship and fort, a 40 foot pirate's plank bridge, a lazy river, and two waterslides. Located only 10 minutes away from the famous Montego Bay Hip Strip. On a private, serene beach but conveniently located five minutes from shopping and entertainment options. Wellness and spiritual offerings include a spa with peaceful gardens, yoga and meditation areas, and a fitness center. Close proximity to three championship golf courses. Complimentary shuttle to Shops of Rose Hall. A stylish and fun resort with contemporary design. Resort exchange privileges with Secrets St. James Montego Bay and Breathless Montego Bay Resort & Spa. Costa Rica cooking class and coffee demonstrations available. Contemporary décor, surrounded by mountain, ocean, and jungle. **Resort coupons are issued per room, per stay. Resort coupons are issued for limited discounts on select amenities including spa treatments, a romantic dining experience, and wine purchases. Resort coupons cannot be applied toward beauty salon services, spa product purchases, telephone charges, dolphin experiences, gift shop purchases, boutique purchases, internet service (where applicable), marina services, dive shop, medical services, car rentals, or travel agency services. Resort coupon offer requires a three-night minimum stay. ^Up to two children, 12 and under, stay free with two paying adults.